Looking for the best WordPress themes you could ever lay your hands on? This list is a result of over 12 years of looking for the best WordPress themes I could possibly find. No, I won’t bother with 22 or 32 top WordPress themes. Choosing from that big a list is a pain by itself. I’ve already done my research. Save your time and pick from this smallish list instead. Hours of research, several instances of installing crappy WordPress themes, and several sleepless nights later, I’ve arrived at a list of WordPress themes (and sometimes WordPress theme shops or marketplaces) that can make for a terrific option if you are looking for WordPress themes. Note: I am a regular WordPress user. I am not one those who can create a theme or tinker with WordPress core. Beyond minor tweaks using Divi or Elementor and a decent eye for design, I can never proclaim to be a WordPress expert. The list starts with some the most popular WordPress Website Builders, each of which have flagship themes that everything else they create is built on top of. Some of the themes listed here are standalone WordPress themes while others are a part of a complete ecosystem of themes, plugins, and other tools. Technically, this isn’t a theme per se. Elementor is a plugin (both free and paid versions available) which helps you customize absolutely any theme you might be using at the moment. Elementor literally lets you drag and drop and make changes to your existing theme, without worrying about messing up code. With an intuitive UX/UI, tons of widgets, and several templates to start with, you’ll be able to create a site from scratch or customize your existing theme in no time. If you were to start with the default WordPress theme, you could use it as the base and employ Elementor to create any kind of a website you like. 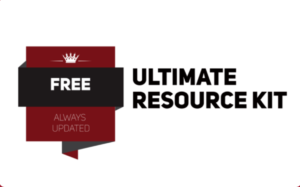 If you need help, you also get tons of templates readily available for you from sites like Envato, TemplateMonster, and third-party theme builders or other resources. The Divi theme is one of the most versatile, capable, lean, and robust themes you could ever use if and when it comes to WordPress. We launch websites in less than an hour, thanks to Blueprints with Flywheel (our host) — a feature using which you can have a default setup of the latest version of WordPress core with a chosen few plugins so that you can launch WordPress websites for clients in a few minutes flat. This is the fixed WordPress set up — with themes and plugins — that we use for all our web design projects. Divi — in addition to the theme — also has one of the most popular visual page builders for WordPress. 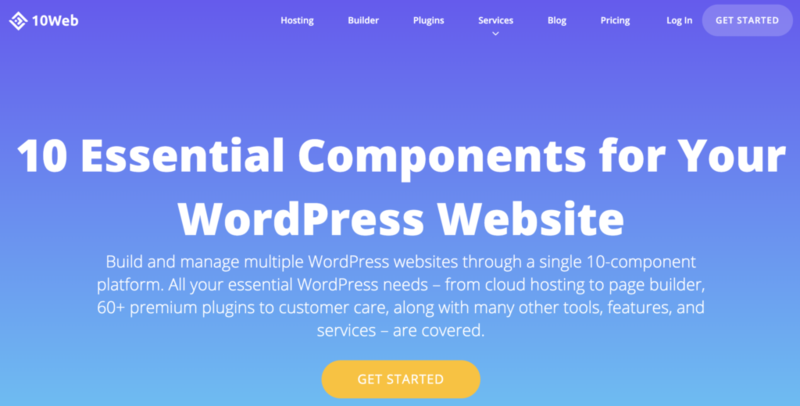 Featuring real-time frontend design, ability to create and edit global elements, and with more than 46 content elements, it’s the easiest visual builder for WordPress there is. The Divi Theme is a part of the Elegant Themes ecosystem which also comes with the Divi builder which lets you customize any WordPress theme, Monarch Plugin for social media buttons, and Bloom for email opt-in sign ups. Learn about Divi, in detail. 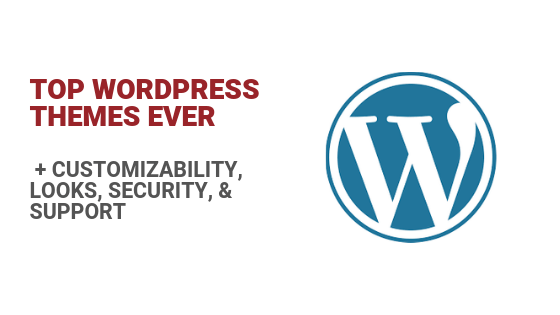 As a small business owner, you don’t want to deal with servers, hosting, backups, design, updating themes, updating plugins, and worrying about WordPress security. Really, you have a business to run (unless running and maintaining websites is your business). With 10Web, you do get fantastic looking themes, but that’s not the only thing you get. The 10Web platform is an entire ecosystem. In fact, the 10 Web Platform comes with the ten most important components for WordPress websites, including: Managed Hosting (on the Google Cloud Network), 60+ Powerful Plugins, Backup Solution, SEO and Image Optimizer services, Website Performance checkup and exceptional Customer Care on top of it, with Site Builder coming soon (based on the powerful Elementor visual website builder for WordPress). The Beaver Builder theme is one of those themes with huge support and clean code. Run by a small team, The Beaver builder is a product of love and care as far as the WordPress community is concerned. As Chris Lema writes, the Beaver Builder theme is backed by the Beaver Builder which is a respectable visual builder by itself allowing you infinite options to move pages around, add sections to specific pages of your website, chance colors, adding CTA buttons, and more. While it gives you all the flexibility you need to design your website, you still get clean code and fast loading pages. Studiopress — with the Genesis Framework and the rest of the popular themes such as Agency Pro and others — have been the poster child themes for the WordPress community. Recently, Studiopress has been acquired by WPEngine. So, if you choose WPEngine as the host, you’ll practically get the Genesis Framework and any of their themes for free (for the hosting fee). Having said that, Studiopress themes are the cleanest, leanest, and the most beautiful I’ve ever come across. While I only experienced high-quality themes when I used their Rainmaker Platform, Studiopress themes are a true example of how WordPress themes should be developed and maintained. Yoothemes is little known (compared to the might of Studiopress, Divi, & Elementor) but they have some of the prettiest themes I’ve found yet catering to both the WordPress and Joomla users. With more than 150,000 users, Yoothemes might not be as big as the others on this list but each theme is carefully created to give you the best of WordPress design on the frontend lying on top of bloat-free themes. On top of that, the folks at Yoothemes provide excellent support.